The Model 8500 Pressurized Foam Rheometer is designed specifically to measure the rheological properties of foamed systems under extended pressure and temperature conditions. 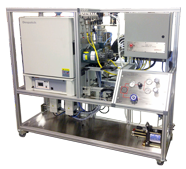 The Model 8500 is a fully automated closed loop system that includes both hardware and software for the study of foam rheology over a wide range of foam qualities, shear rates and shear stresses. An integrated high pressure view window allows visual determination of foam quality, stability and bubble distribution. An optional CCD camera and image acquisition system is available for video capture and image analysis of the foam through the view cell. The system incorporates a pulse free positive displacement Quizix pump for injection of the base fluid and volume determination. Differential pressure transducers are provided to cover a wide range of shear stress measurements. Flow rate and shear rate of the foamed fluids are measured using a Coriolis mass flow meter. The shear loop is contained within a convection oven housing enabling uniform temperature control of all components within the loop. The Model 8500 is a fully automated rheometer. The software is designed to allow the operator control over foam quality, shear rate, shear stress, time length of tests and operating temperature. The Model 8500 utilizes a calibrated volume to calculate and control the percentage of foam quality.